Key skills: programming, web, UI/UX, database, GIS, cartography, geostatistics, remote sensing, spatial ecology, modelling. Hugh is an environmental informaticist who uses computation to make complicated ecological problems easier to think about. Hugh studied ecology and briefly planned to spend his life researching lichen, but after doing field work for remote sensing in the Amazon got drawn back to a childhood interest in computers. 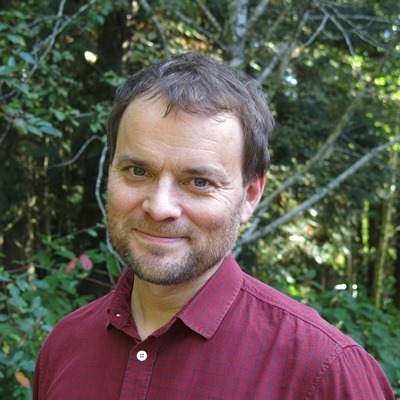 Work in conservation GIS labs at UC Davis and the Smithsonian Institution led him back to school for environmental informatics and complex systems studies. Since then he has been deep-diving into data and the web, working as a consultant to conservation non-profits, government and businesses, with a focus on geospatial analysis and visualization. 60 projects over 8 years expanded his technical toolkit to include more advanced coding, database design, geostatistics, cartography, UI/UX, and web architecture. In that latter capacity he worked as product manager at a civic tech startup, where for several years he helped oversee a small team building an award winning public engagement platform with over 20 000 users. He has also taught web mapping and data-driven storytelling to conservation professionals, students, and journalists in Canada, the US and Venezuela. At ESSA Hugh is returning to his ecological roots, bringing his technology and project management experience with him. His professional goals include finally getting to use his training in environmental modelling, and exploring more adventurous forms of computation like solution-space traversal and machine learning. Mostly he wants to absorb the terrestrial and aquatic ecology knowledge of his colleagues and clients, and to help them build tools and processes for making better decisions about those things. Hugh attended high school in Collingwood Ontario with ESSA colleague Marc Nelitz. He also holds a BSc in Pure and Applied Ecology from the University of Guelph and an MSc in Environmental Informatics from the University of Michigan. His Masters thesis used aerial imagery and spatial pattern quantification to investigate self-organization of woody vegetation in the American drylands. He once spent 8 summers planting over a million trees by hand, mostly in Alberta. Hugh now lives in East Vancouver with his girlfriend and daughter, and occasionally leaves there to marvel at the beaches and sushi restaurants in the rest of Vancouver, or to set up a tent somewhere in the ridiculous fantasyland that is British Columbia.